Complete a full circuit of the peaks and summit Pt Lenana 4985m & Pt John before we tackle the technical routes up Nelion 5188m and Batian 5199m above sea level. This is a technical rock climb and the challenge of this mountain that straddles the equator is not to be taken lightly. Sheer rock, awesome exposure, high altitude tarns, equatorial glaciers and unbelievable scenery! Technical Climbing,Rock Climbing,Ice climbing on the Main peaks of Mt Kenya (Batian 17,058 ft. Nelion 17,022 ft) Climbing the ‘Diamond Couloir‘, South-East Face Route and North Face route. Mount Kenya in Mount Kenya National park has unique position on the equator offers climbing seasons and route conditions varying with the sun’s Position. 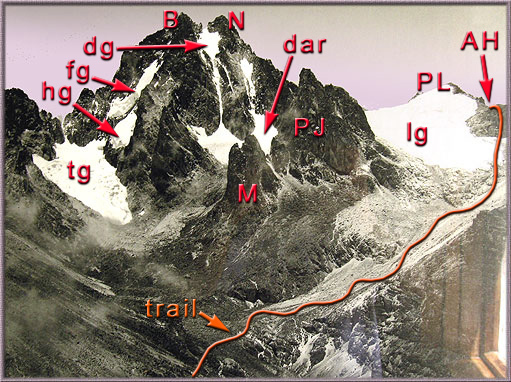 This attempt to the main summit of Point Lenana (4,985 m) is included for people not wishing to attempt the much more difficult twin summits of Mt. Kenya Nelion and possibly Batian. is technically a much difficult scramble. 5. CHOGORIA-CHOGORIA 7-DAY SUMMIT CIRCUIT HIKE. 6. CHOGORIA SIRIMON 7- DAY SUMMIT CIRCUIT HIKE.